Born at Fethard Castle, Co. Wexford, Richard Bourne entered the Royal Navy as a volunteer in 1787. 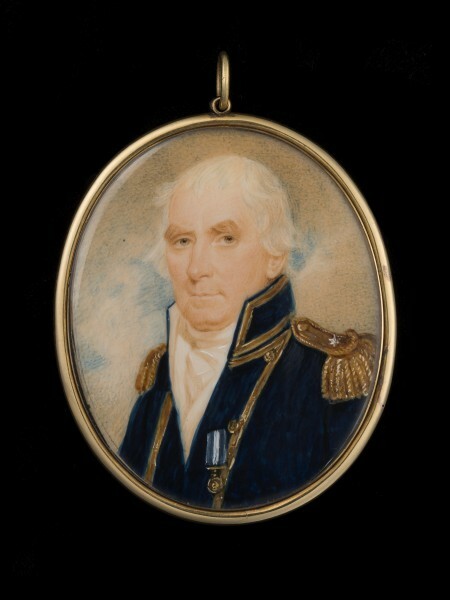 Made midshipman in 1789, he joined HMS Crescent , Captain James Saumarez, seeing action early in the war with France when his ship captured the frigate La Réunion in a celebrated action which earned Saumarez a knighthood. In 1795, Bourne was wounded in boat action off Le Havre whilst serving under the famed Sir Sidney Smith in HMS Diamond. On return to service he was appointed Lieutenant in HMS Sandfly—a special ship designed as a floating battery mounted with four massive 68 pounder guns —in which he defended the small, but strategically important, Îles St Marcouf off Normandy, captured by the British in 1795. On 7 May 1798, he helped repulse a major amphibious assault on the islands by a French force consisting of some 9000 troops and over fifty landing craft. The attack was envisaged as a rehearsal for the planned invasion of England; however, it turned to disaster beneath the devastating fire of British batteries ashore and Bourne’s guns afloat. The morale-boosting victory was widely celebrated in England but despite recommendation, Bourne was passed over for promotion. After his death, Bourne’s family blamed this snub on a grudge held by King George III for an earlier attachment between Bourne’s eldest brother Charles, and Princess Charlotte of Mecklenburg-Strelitz, later Queen Charlotte. Indeed, Bourne would not be promoted again until 1840 when, on retirement from the Royal Navy and under an Order of Council from 1816, he was promoted commander (Captain Bourne RN was the courtesy title). In 1804, after several years on half pay, Bourne was appointed to Felix, a 12 gun schooner, in which he defeated a far larger Spanish warship off St Andero (now Santander) in northern Spain, an action which earned him £100 worth of silver from Lloyd’s Patriotic Fund. A few months later, on 28 July 1806, Bourne led a successful assault on the Spanish fortress at Hea, rolling the enemy guns over a precipice and destroying several vessels. This was followed, just three weeks later, by another assault at St. Pedro del Mar on the Murcia coastline of south east Spain where Bourne burned more enemy vessels and spiked the shore batteries, earning a further £200 reward from Lloyd’s Patriotic Fund. Bourne was severely wounded at St. Pedro del Mar and this—combined with despair at his prospects of promotion and concerns over the seaworthiness of Felix (which soon afterwards foundered)—prompted his early retirement from active service curtailing an exceptional and vivid career in the Royal Navy. Still in his thirties, Bourne now turned his buccaneering and daring naval skills to business. He joined his brothers Henry, William and Frederick, in running the lucrative mail coach business they had established in Ireland in the late 18th century. Granted a contract in 1789 by the Irish government to introduce a mail coach service to the country, the brothers built and maintained roads to Limerick and Cork – to support the valuable Atlantic trade – and subsequently to Drogheda and the north of Ireland. Despite heavy capital investment; with a long lease, a monopoly of the tolls and ownership of the inns and hotels which lined the route, the business flourished making the brothers’ fortune. From offices at 48 Dawson Street, next to the Royal Hibernian Hotel which the brothers owned, they oversaw an integrated network of roads and businesses which stretched across the country. They built mail coaches at Blackpits in Dublin keeping over 800 horses on grazing nearby to pull them. The Bourne were described as “people of opulence” and “some of the most important people in the country”. With their wealth, they purchased property across Ireland including Terenure House near Dublin; Springmount House in Co. Queen’s and Lynbury House in Co. Westmeath where Richard Bourne settled. Exhaustion, no doubt exacerbated by his old wound, forced Bourne to step down from the mail coach and road business in 1823. After investing some capital in a new shipping company set-up by his brother William running two steam ships between Dublin and London, he travelled overseas to recover his health. However, when poor management threatened the shipping business, Bourne returned to Dublin and took control, refinancing the failing enterprise and purchasing, with his own money, an additional ship The City of Londonderry. The Dublin and London Steam Navigation Company flourished and in 1835, Bourne negotiated an exclusive contract with the Spanish government to run a steamer service to the Iberian peninsula. Two years later in 1837, now in partnership with London ship brokers Arthur Anderson and Brodie McGhie Willcox; Bourne co-founded The Peninsular Steam Navigation Company (P&O) securing the valuable government contract to carry the mail between Falmouth and the peninsular ports, as far as Gibraltar. This was followed, in 1840, by the even greater reward of a contract to carry mail to Egypt then, in 1842, to India. Bourne owned six of the seven steam ships which launched the new shipping company. The large amount of capital required to purchase steam ships capable of such arduous voyages was secured when the company was incorporated by Royal Charter on 31 December 1840 as The Peninsular and Oriental Steam Navigation Company. By the merger and acquisition of smaller shipping companies and by securing new routes, such as to Singapore and down the Nile, the growth of the company was rapid and its success to this day was assured. The only one of the P & O founders with seafaring experience, and with a highly astute business sense, Bourne maintained a keen active interest in his business into old age. Eventually infirmity forced him to retire to his home at Blackheath, near London where he died on 9 October 1851. His body was afterwards carried to Ireland to be interred alongside his brothers in the family vault at Mount Jerome Cemetery in Dublin. A fulsome obituary to Bourne appeared the following month in The Artizan, a journal dedicated to engineering founded by his son John. 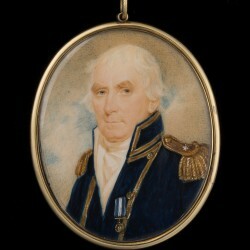 The miniature was painted after Bourne was promoted commander in 1840 with the apparently posthumous later addition of a Naval Gold Medal, which Bourne was not awarded; or of the Naval General Service medal (issued 1849) which Bourne may have been unable to apply for in his own lifetime. There is a large oil on canvas portrait of Bourne in the P&O Heritage Collection. 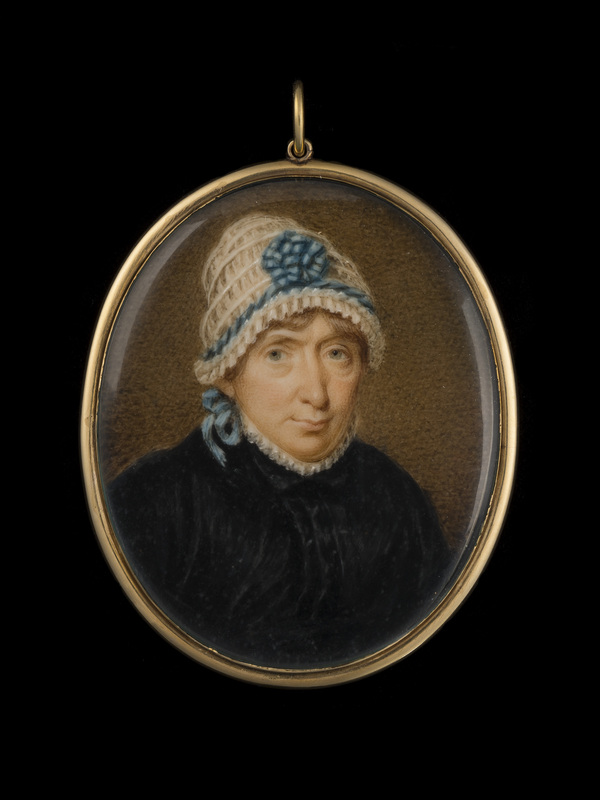 On 21 December 1821, Bourne, then resident at Lynberry in Co. Westmeath, married—apparently for a second time although details of his first wife are not known—Louisa Helena Blake (1796-1865), the daughter of Ignatius Blake, a captain of Dragoons and a scion of the ancient Blake clan in Galway. The Blakes were rich from the tobacco and West Indian trade, and well connected: Louisa’s grandfather had been ennobled as Lord Wallscourt, a title her brother inherited shortly before her marriage.